Throughout history, philosophers have sought the truth about everything — a comprehensive understanding of the world and our place within it. Within the modern university a professional discipline has attempted to bring structure to philosophy, and has organized the history of philosophy into a series of schools, movements, and great individuals who have espoused an evolving set of theories about knowledge, reality, mind, and so on. But in this well-intended pursuit of truth, have we lost sight of what philosophy is? The Truth about Everything is an approach to the history of philosophy from well outside the modern institutional framework of knowledge. With an unusually frank and irreverent style, using parables, imaginary dialogues, and illustrations, Matthew Stewart picks apart the myths which make up widely accepted versions of the history of philosophy, and offers in their place a realistic assessment of individual philosophers and schools and their contributions to the advance of human knowledge and happiness. This dramatic recasting of the history supports two theses: first, rational consciousness is not, as the usual story has it, the outcome of an historical process and the sole property of the Western tradition; second, philosophy is not a specialized, professional discipline with privileged access to reason, knowledge, and/or virtue. Stewart suggests instead that philosophy is a general disposition, an attitude of respect and love for knowledge, which can be made a part of anyone’s life, at any time. 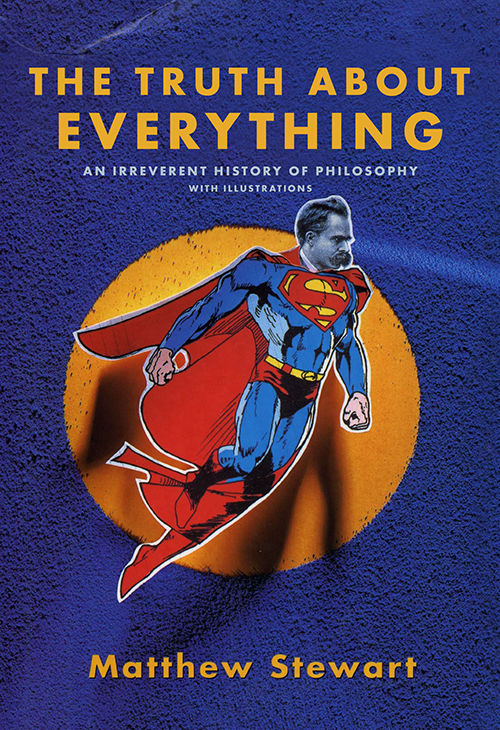 The Truth about Everything is a useful guide for beginners in philosophy as well as an innovative alternative for those already familiar with more traditional versions of the history.